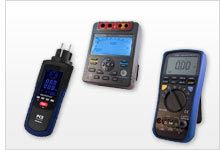 At PCE Instruments you will find an isolation meter for a variety of ranges between 50 mega ohms and 2000 mega ohms. The portable manual isolation meter is used fordetermining insulation resistance, continuous current, alternating current and testing. With an isolation meter, measurements can be taken for different voltages, beginning with 100V up to 10,000V. Measurements meet the DIN VDE 0413 part 1 standard. The isolation meter comes with a test mechanism, clips, batteries and a carrying case. The isolation meter can be equipped for test laboratories if an optional DIN EN ISO is acquired. Measurement of insulation in cables and motor coils is vitally important for the prevention of accidents and damage to installations and is obligatory according to most codes of conduct. Isolation Meter for insulation resistance up to 2000 MΩ. This isolation meter PCE-ITM 20 combines a versatile multimeter with an insulation tester. In addition to the usual measured quantities such as voltage, current and resistance, this isolation meter PCE-ITM 20 is also equipped with a frequency and capacitance measurement.